The air force of Syria's president Bashar al-Assad appears on Thursday to have deliberately targeted a hospital in Aleppo with airstrikes, killing dozens of doctors and children. According to US Secretary of State John Kerry, "It appears to have been a deliberate strike on a known medical facility and follows the Assad regime's appalling record of striking such facilities and first responders. These strikes have killed hundreds of innocent Syrians." Destroying a hospital is typical of Bashar al-Assad. This is a man who gets obvious pleasure from gouging out people's eyes or pulling out their fingernails, or send missiles into school dormitories to kill children, or dropping barrel bombs laden with metal and chemical weapons on civilian neighborhoods, or using Sarin gas to kill large groups of people. He considers all Sunni Muslims to be cockroaches to be exterminated. Bashar al-Assad is the greatest genocidal monster in today's world, comparable to Hitler, Pol Pot, Mao Zedong and Stalin from the last century. There is no mass weapon of destruction, nor any gruesome form of torture, that he won't use to satisfy his psychopathy. The news today is that officials are complaining that the Syria "peace process" is hanging by a thread, in the words of Staffan de Mistura, the UN envoy to Syria. But these officials are paid to live in a fantasy world of denial. As I've written many times, no one seriously believed that there was any sort of actual peace process going on. And as I've written many times, any movement to peace is impossible with al-Assad in power in Syria, because he's determined to keep dropping barrel bombs with chemical weapons on Sunni civilians until every Sunni in Syria is exterminated. The reason that Thursday's airstrike on the Aleppo is significant news is that its sheer brutality and savageness makes it clear to even officials in denial that al-Assad has no intention of entering into any peace agreement. From the point of view of Generational Dynamics, al-Assad may be making a fundamental error, by not understanding the differences between generational eras. Syria's last generational crisis war was the civil war that climaxed in 1982 with the massacre at Hama. There was a massive uprising of the 400,000 mostly Sunni citizens of Hama against Syria's president Hafez al-Assad, the current president's father. 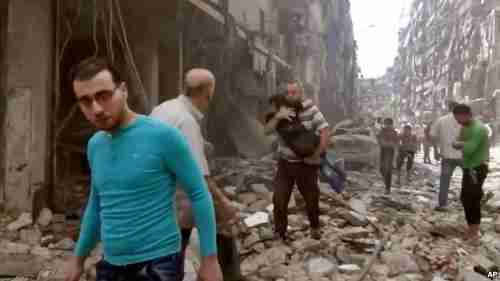 In February, 1982, al-Assad turned the town to rubble, 40,000 deaths and 100,000 expelled. Hama stands as a defining moment in the Middle East. It is regarded as perhaps the single deadliest act by any Arab government against its own people in the modern Middle East. But once the Hama was destroyed, the anti-government movement against Hafaz al-Assad pretty much ended. From the point of view of Generational Dynamics, this was a generational crisis war climax, like the nuking of Hiroshima at the climax of World War II, bringing the war to an end. Now Bashar al-Assad may believe that he's in a similar situation in Aleppo. It's quite possible -- even quite likely -- that al-Assad intends to turn the city of Aleppo to rubble, and then gain a complete victory, as his father did in 1982. With Japan's economy in a deep slump, most analysts expected the Bank of Japan (BOJ) to add stimulus to the economy by one form or another of "printing money" -- by increasing its purchase of bonds ("quantitative easing") or by lowering the interest rate, which is already negative, to make it even more negative. Instead, the BOJ announced on Thursday that it would not add any new stimulus to the economy at all at the present time. This was a shock to investors, who responded by selling off stocks, causing the Tokyo Stock Exchange Nikkei index to plummet 3.6%. This triggered a world wide selloff on Thursday, though generally not as deep as the Nikkei selloff. The Bank of Japan adopted negative interest rates three months ago, in what was considered a move of desperation. ( "30-Jan-16 World View -- Japan tries negative interest rates as US economy slows") But that move has been ineffective in promoting economic growth, so the BOJ may have decided that another stimulus move wouldn't make any difference. Actually, not adding stimulus did make a difference of a kind that wasn't expected. Using stimulus over and over to push up the stock market cannot work forever. By the Law of Diminishing Returns, each new injection of stimulus will have a smaller effect that then previous injection. What this illustrates is the dependence in today's world of stock markets on central banks. No one serious believes any more that the stock market is meaningfully related to a country's economy. The stock markets today are being held up by the central banks -- by the BOJ in Japan, the European Central Bank, the Bank of England, and the Federal Reserve in America. The Fed raised interest rates by 0.25% in December, and that move is widely thought to have harmed the US economy. Today, just about the only stories important to financial media are the debates over whether the Fed is going to raise rates again, or whether it will reverse the December increase.